I read a book, not too long ago, that I did not write a review for. Not because it wasn't good, but because I wasn't sure how to describe it or how to describe how it made me feel. The book has stuck with me for some time now, haunting me in the oddest ways. Most recently, I took a little vacation to a nearby town, and I kept thinking about passages from the book and the characters in the story. Please allow me to explain. If you read my blog, you know I love to find random books I've never heard of. 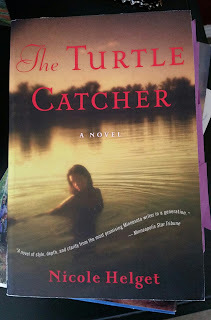 In one of my treasure hunts through a bookstore, I came across The Turtle Catcher by Nicole Helget. I loved the cover (because I am a cover lover), and the title of the book seemed odd when compared to the picture. It pulled me in, and I read the back cover. The hook was complete. "In the tumultuous days after World War I, Herman Richter returns from the front to find his only sister, Liesel, allied with Lester Sutter, the "slow" son of a rival clan who spends his days expertly trapping lake turtles. Liesel has sought Lester's friendship in the wake of her parents' deaths and in the shadow of a dark secret of her own. But what begins as a yearning for something of a human touch quickly unwinds into a shocking, suspenseful tragedy that haunts New Germany, Minnesota, for generations. The Turtle Catcher is a lyrical, vibrant, beautifully wrought look at a fascinating piece of American history - and the echoing dangers of family secrets." I couldn't say it better myself...without giving something away. It is a story you need to unfold for yourself. I won't lie, there are parts that show the horror of many things: war, betrayal, cruelty, secrets. There were times I found my hand covering my mouth in disbelief, as I shook my head from side to side, to think such things could happen. And they did. Yes, it's fiction, but it's also realistic - particularly for that time in history. The book played out even more vividly in my mind when I took a little vacation to Fredericksburg, Texas, for a couple of days over Thanksgiving holidays. The small town is rich in history. It was founded by Germans in 1846 and their culture is everywhere. I didn't mean to associate it with the book I had read, it just happened. In my mind, the town was very much like the one described in the novel. As I walked up and down the main street in town, I could imagine what it would have been like in the days after World War I. While I warn you that parts of the novel will disturb you, as the reality of human cruelty is always disturbing, the novel is very worthy of your reading time. It is well-written, interesting, and pulls you in from the very beginning. It also does what is most important for a book to do: it makes you think.